8-speed, hydraulic brakes front and rear, high capacity battery, hi-speed hub motor, 24kgs. 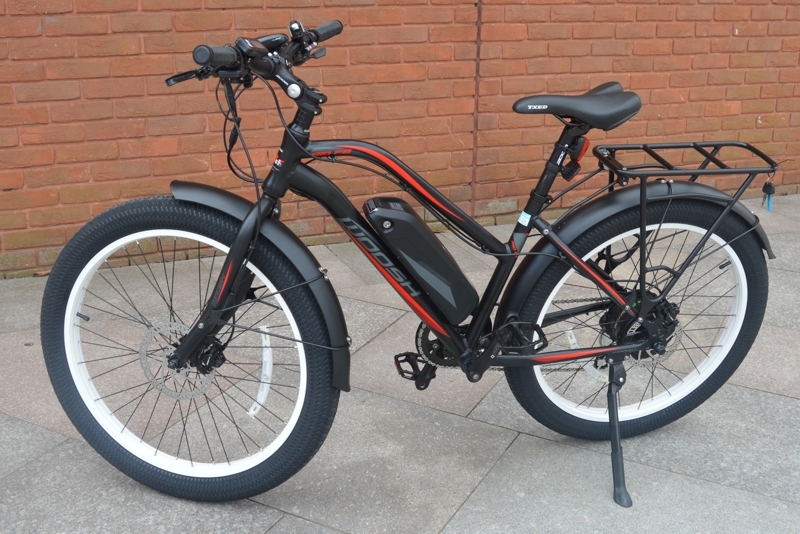 New shape 18" low step frame, adjustable riding position, about 25 miles on flat roads with 13AH battery. The new Rio Low Step FatBoy is just as comfortable on road and off-road. Pedal assist and thumb throttle. To turn on the electrics, press the middle button labelled M to the left of the LCD display on the left handlebar. There are 6 levels of assistance, 1 provides the least assistance, 6 the highest. As well as pedal assist, the Fat Boy has a throttle on the left. Start pedalling or push on the throttle's lever, the motor will kick in and the bike will woosh you along nicely - the motor is very quiet. 24kgs – light enough to ride without power.